HECTOR OLIVERA is a passionate, gifted, and unique musician, whose personal interpretations of both classical and popular music have amazed and delighted audiences around the world. He has performed as guest soloist with many orchestras, including the Pittsburgh Symphony, the Fort Wayne Symphony, the Dover-New Philadelphia Orchestra, the Dallas Symphony, the Cleveland Orchestra, the Amsterdam Baroque Ensemble, the Minnesota Orchestra, and the Pasadena Symphony. He has also recorded more than 20 classical, contemporary, and ﬁlm score transcriptions. Although he is most famous for his prodigious technical proﬁciency, Hector Olivera’s amazing effect on audiences has made many of the most sophisticated and demanding organ aﬁcionados claim that Hector Olivera is one of the greatest organists in the world today. 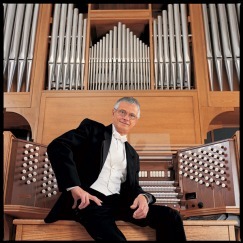 In this concert, Hector will play two separate instruments: the large pipe/digital organ of the church and the Roland Atelier, a multi-keyboard instrument that duplicates the full range and breadth of a symphony orchestra. Hector’s concert selections will range from Classics to Gershwin to current Broadway and movie selections. Hector is known for his fiery and passionate playing, coupled with his unique wit and humor. Hector’s concert in Dover will be his only appearance in northern New England this year.